Finding the right style for kids is usually about finding a cool, fun, and easy-to-manage haircut that suits your youngster's active lifestyle. Children start to take an interest in their own hairstyles from an early age and it's great to encourage them to choose a style and teach them some hair care tips. It's important for children to develop good eating habits because healthy hair is dependent on high-quality carbohydrates, protein and plenty of fresh fruit and vegetables. Good nutrition promotes shine and conditions hair. Getting younger children to go to the salon, to agree to the hair style you want, and to do the needed hair care could be a challenge. You may experience resistance even when trying to wash or comb your children's hair. 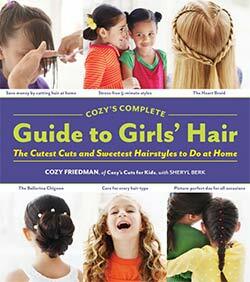 In fact, for many children a trip to the hair salon is like a visit to the doctor or dentist. There are special hair salons for kids with a smiley stylist and Bugs Bunny on TV that can make the haircutting experience more positive and entertaining for small children. Sometimes our children have unwarranted fears, but we can help them to overcome them. Creating trust by taking their concerns seriously is the first and most important step. If you've been thinking about cutting off your children's long hair or that mane of hair you've maintained since the days of Big Hair for women and ponytails for men, please consider the option of donating your hair for kids in need. If your child is afraid of the hairdresser's, then try to cut their hair at home. They will feel safe and comfortable and you will save time and money. However if you don't have any haircutting experience, you might want to seek out a step-by-step guide on children’s haircutting. Trouble washing your child's hair? Try to use a mild shampoo in his or her favorite color or scent. Sometimes children are more willing to wash their hair with a fun shampoo, especially if it doesn’t sting their eyes. Children's skin is young and very sensitive to many chemicals that included in synthetic hair care products, including perfumes, colors and other preservatives, so we need to treat our little one's gently with child-friendly, natural and organic products. 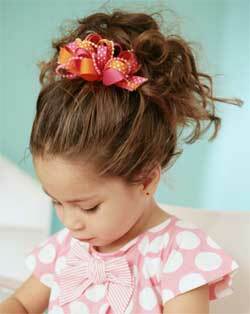 Read more about why you should consider natural and organic hair products for your kids! Do you have a problem with matted hair or tangled hair? Read this community post for answers and solutions. If you're having trouble combing their hair, try to create trust and reassurance by allowing them to comb and brush their own hair on their own terms. Do not brush your child's hair with 100 strokes before bedtime in the traditional manner. Although combing the hair will promote shine and condition, brushing to this extent will over-stimulate the sebaceous glands and make the hair greasy and heavy. Doing a quick brush to get the tangles out should be sufficient.